Kids Can Press has partnered with the Khaled Hosseini Foundation to offer free curriculum for the press’s fall middle-grade picture book, Razia’s Ray of Hope: One Girl’s Dream of an Education. Written by Elizabeth Suneby and illustrated by Suana Verelst, the book is part of Kids Can’s global issues focused CitizenKids collection. The story is based on the true stories of the students of the Zabuli Education Center for Girls, just outside Kabul. The Khaled Hosseini Foundation, a nonprofit humanitarian organization founded in 2009 by author Khaled Hosseini and his wife, Roya, aims to build shelters for refugees in Hosseini’s home country of Afghanistan, as well as to provide economic opportunities, education, and health care for women and children. 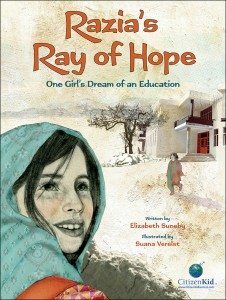 Razia’s Ray of Hope is the first middle-grade book to be incorporated into the foundation’s curriculum program, called Student Outreach for Shelters. It is also the first book in the program not written by Hosseini. Until now, the program has only included secondary school lesson plans based on Hosseini’s three bestselling novels, including his latest, And the Mountains Echoed. In addition to offering lesson plans, the SOS program also incorporates a toolkit for students to raise funds to build shelters for refugees in Afghanistan. Kids Can worked with a U.S. curriculum expert to develop lesson plans related to the book. Three curriculums are available to educators, geared to grades one through three; grades four and five; and grades six through eight. The lesson plans can be downloaded for free on the SOS website.